IBM Corp. (IBM - Get Report) is the best-performing component of the Dow Jones Industrial Average so far in 2019 and has the highest dividend yield of 4.70%. This member of the 2019 "Dogs of the Dow" closed last week at $139.46, up 22.7% year to date and in bull market territory 31.6% above its Dec. 26 low of $105.94. The stock is cheap with a P/E ratio of 10.09, according to Macrotrends. My call to buy IBM is supported by its daily chart, which shows that a formation of a "golden cross" appears highly likely this week. A "golden cross" occurs when the 50-day simple moving average rises above its 200-day simple moving average to indicate that higher prices lie ahead. The weekly chart is positive but overbought and the stock appears poised to rise to its 200-week simple moving average at $149.34, which I consider a return to its "reversion to the mean." The "reversion to the mean" is where a stock should be trading given all known information about the company. As a market technician i consider this to be the 200-week simple moving average. IBM should be considered a play on the theme that "everything old is new again." The company has a string of 17 consecutive quarters of beating analysts' earnings-per-share estimates. During the fourth-quarter bear market, IBM gapped lower on weak earnings guidance on Oct. 16. Then on Jan. 21, the stock gapped higher on a better-than-expected outlook. When I graduated from Georgia Tech in 1966 as an Industrial Engineer, my first job was at Grumman in Bethpage, Long Island. While getting my Master of Science degree at Brooklyn Poly, I taught myself how to program in Fortran. I took over a program used in manufacturing engineering and had access to IBM 360 mainframe computers both at work and at school. The concept of the old mainframes is now new again as IBM's cloud computing is on mainframes not a farm of servers. I say that this is a more secure platform. This platform will be enhanced as the company integrates offerings based upon IBM's acquisition of Red Hat Inc. (RHT - Get Report) . What makes IBM new again will be the development AI applications based on the Watson platform and competitive offerings in data analysis, mobile technologies and security. Let's look at the daily chart for IBM since its Dec. 26 low of $105.94. That day was a "key reversal" as the day's close at $111.39 was above the Dec. 24 high of $111.00. This signal confirmed a tradeable rally. 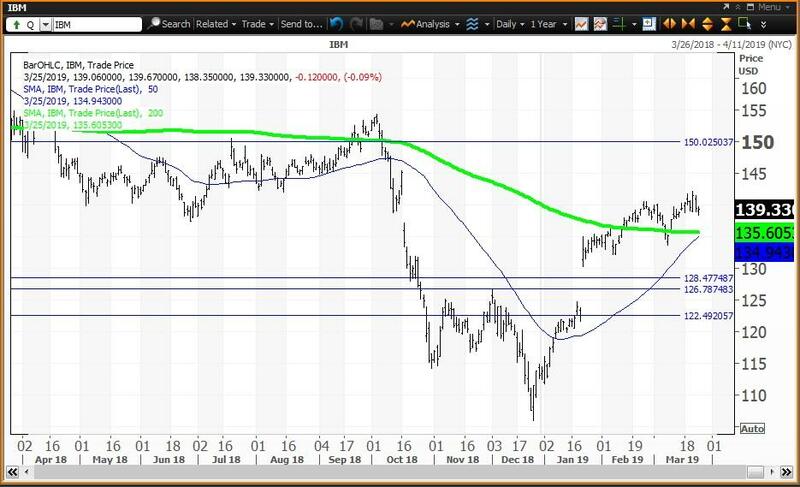 The close of $113.67 on Dec. 31 was input to my proprietary analytics and resulted in semiannual and quarterly pivots at $126.75 and $122.49, respectively, and in an annual risky level at $166.09. Notice how the quarterly level of $122.49 provided a buying opportunity on Jan. 22. The close of $138.13 on Feb. 28 was an input to my analytics and resulted in a monthly value level at $128.45. Note how the 50-day simple moving average at $134.95 is rising toward its 200-day simple moving average at $135.61. When the 50-day crosses above the 200-day, a "golden cross" will be confirmed and indicate that higher prices will follow. 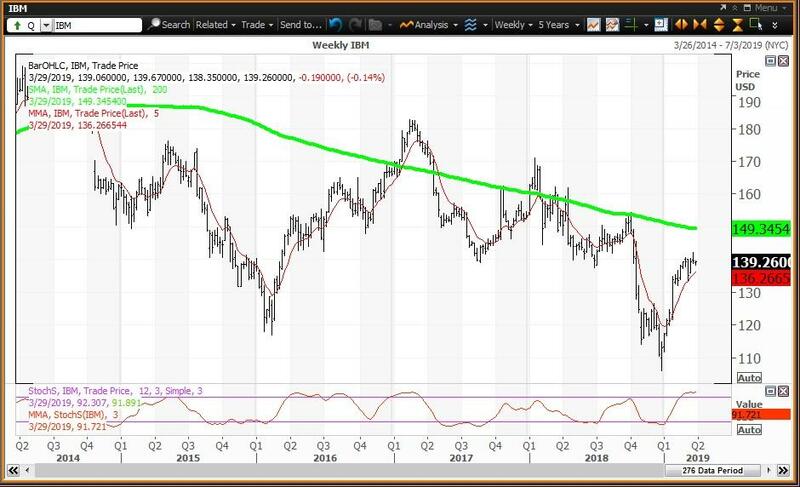 The weekly chart for IBM is positive but overbought with the stock above its five-week modified moving average of $136.32. The stock is below its 200-week simple moving average or "reversion to the mean" at $149.35 last tested during the week of Oct. 5 when the average was $153.66. The 12x3x3 weekly slow stochastic reading is projected to rise to 91.83 this week up from 91.43 on March 22. This reading is well above the overbought threshold of 80.00 and the reading above 90.00 makes the stock an "inflating parabolic bubble." Trading Strategy: Buy weakness to the 200-day simple moving average at $135.61 and reduce holdings on strength to the 200-week simple moving average at $149.35. Value levels and risky levels are based upon the last nine weekly, monthly, quarterly, semiannual and annual closes. The first set of levels was based on the closes on Dec. 31. The original quarterly, semiannual and annual levels remain in play. The weekly level changes each week; the monthly level was changed at the end of January and February. My theory is that nine years of volatility between closes are enough to assume that all possible bullish or bearish events for the stock are factored in already. To capture share price volatility, investors should buy on weakness to a value level and reduce holdings on strength to a risky level. A pivot is a value level or risky level that was violated within its time horizon. Pivots act as magnets that have a high probability of being tested again before its time horizon expires. My choice of using 12x3x3 weekly slow stochastic readings was based on back-testing many methods of reading share-price momentum with the objective of finding the combination that resulted in the fewest false signals. I did this following the stock market crash of 1987, so I have been happy with the results for more than 30 years. The stochastic reading covers the last 12 weeks of highs, lows and closes for the stock. There is a raw calculation of the differences between the highest high and lowest low vs. the closes. These levels are modified to a fast reading and a slow reading and I found that the slow reading worked the best. The stochastic reading scales between 00.00 and 100.00 with readings above 80.00 considered overbought and readings below 20.00 considered oversold. Recently, I noted that stocks tend to peak and decline 10% to 20% and more shortly after a reading rises above 90.00, so I call that an "inflating parabolic bubble" as a bubble always pops. I also call a reading below 10.00 as being "too cheap to ignore."